Midé has recently completed successful high pressure testing of our unique Atmospheric Diving Suit (ADS) joint design at the Naval Surface Warfare Center (NSWC) Panama City Division’s Hydrospace lab. The project and the testing at PCD was featured in an article called “Deep Dive” by Edward Lundquist in the December ’17 Sea Power Magazine. Midé is actively working on a project for the Office of Naval Research Undersea Medicine Program to develop a next generation Atmospheric Diving Suit (ADS). The effort has focused on creating a new joint type for the suit. Atmospheric Diving Suits (ADS) are traditionally hard shell suits that provide a single atmosphere internal pressure such that a diver can ascend and descend very deep under water quickly without the hazards associated with traditional diving methods (i.e. decompression sickness). Current ADS are essentially one man submarines; are difficult to deploy due to their large size, and have limited maneuverability and capability at depth. Midé in partnership with MIT (MVL, OE, 2N) have endeavored to create a next generation Light-Weight Atmospheric Diving Suit (LWADS) featuring a novel hydrostatically balanced joint design. The new joint(s) will enable ADS divers to move in a more natural manner underwater. This will allow ADS greater maneuverability and dexterity at depth, and lead to broader ADS usage and mission capability for Navy divers. - Created a one of a kind flexible joint, which uses an internal support structure that accommodates and balances external hydrostatic pressure loading at all deflection angles. Offloads user during operation and allows for increased joint flexibility, which will allow the diver to move in a more natural bending motion. 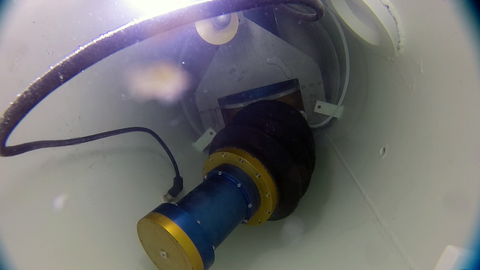 - Designed robotic test arm to mimic human motion/forces during underwater high pressure hydrostatic testing. - Completed joint/arm underwater hydrostatic bending testing at NSWC PCD up to 450 Psi (1000 FSW) See page 39 under Innovation Hub of Sea Power Magazine.